Nichijou – My Ordinary Life is one of those special anime gems that come along once in a blue moon. It claims to be ordinary but believe you me this series is anything but. While it falls under the slice of life genre it really deserves its own sub genre – slice of extraordinary life. This is an anime series that revels in the absurdity it indulges itself with all the while treating its bizarre happenings as ordinary. That in and of itself is part of what makes Nichijou so damn fun – the weird is normal and the normal is weird – Nichijou is genius. It is difficult to pin down a series as wild as Nichijou. There is a lot that goes into the fun this series creates, so much so that to put exactly how enjoyable this anime can be into words is no easy task to undertake. Put simply it is something very special. The strange and more often than not over-the-top style of humour gives life to some of the most ridiculous scenes in anime history. 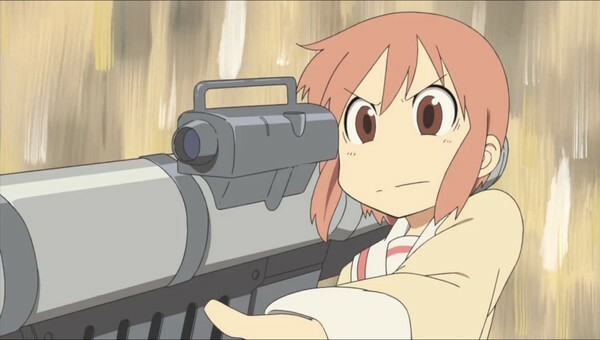 To clarify I feel that previous sentence to be an understatement of just how crazy Nichijou can be. Underneath all of its crazy however is unbridled heart and deft intelligence. While there is no exact concrete plot in Nichijou – My Ordinary Life, it does feature an uniquely engaging cast of characters and setting that lend themselves well to comedy and short-form story-telling. 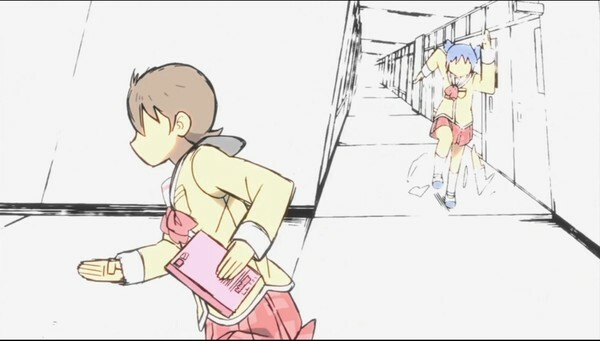 Episodes of Nichijou features a number of short stories or in some cases straight-up skits. Each segment generally involves something incredibly ordinary being treated in such an extraordinary way, for example in an early scene robot girl Nano tripping over results in an explosion reminiscent of the famous explosion seen in the film Akira. This over-the-top sensibility lends itself well to the comedic style of Nichijou. Nichijou’s cast is immense and well defined, growing deeper and more established with each passing episode. Not only that but it has probably one of the most distinct and varied cast of characters in recent memory, featuring robot girls, talking cats and even goat-riding bishonen. The core of Nichijou – My Ordinary Life is the way it finds the remarkable in the monotonous. Things that would be normal routine for most people become incredibly dramatic. That is where the comedy lies, in drawing out the ridiculousness in daily life. The ordinary is extraordinary in Nichijou and that is why it is so damn fun. The only problem with this release is that it ends too soon, thankfully Collection 2 will pacify any desires for more. Inconsistent animation can be an issue that many series face. Nichijou is consistently inconsistent, changing art style numerous times throughout even just a single episode. Through all of its changes though it retains a sense of consistency and upholds its high standard of quality that it sets from the very beginning. This is not something one can often expect in a comedy series, which is of course a genre notorious for low budgets in regards to animation. Fortunately Nichijou has no issues whatsoever and simply looks gorgeous from the start of this collection until its conclusion. The visual variation on show in Nichijou – My Ordinary Life is remarkable to say to least. It does not fail to impress with unique imagery being showcased each and every episode. Not only that but Kyoto Animation have done an excellent job in terms of character designs. There is a distinct style conveyed through these characters, which does admittedly evoke a feeling similar to that seen in series like Azumanga Daioh. It is an appealing cute look that is as memorable as it is a pleasure to watch in motion. In terms of audio, Nichijou’s soundtrack is an impressive one by all counts. The incidental music is well timed and composed beautifully. The opening theme and ending themes are also well done. I noticed something interesting with the ending themes though, it appears as though they were remixed a few times throughout these first 13 episodes. Regardless it still sounded good in each incarnation. Unfortunately due to problems caused by the collapse of Bandai Entertainment in America am English dub for this release was never produced which leaves this as a subtitle only collection. There is nothing wrong with that but it does take away from the overall product, which would have been well served by an English dub. 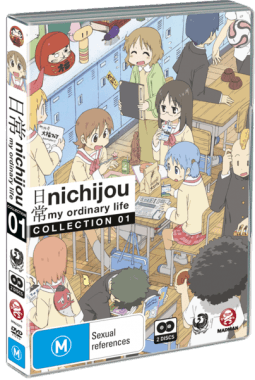 This particular collection features the first 13 episodes of Nichijou – My Ordinary Life, a great number of episode by most standards. It is a little unfortunate that there is not much in the way of bonus content for this release however. Madman Entertainment have included mostly standard extras like trailers, promos, commercial and textless songs. But there is something interesting to be seen in the alternative episode previews that they have included as part of the special features. It is a nice touch to an all round solid product. Nichijou – My Ordinary Life is far from your ordinary anime. It is an incredibly enjoyable comedy anime series with a great deal of heart beneath its silly moments and wacky characters. 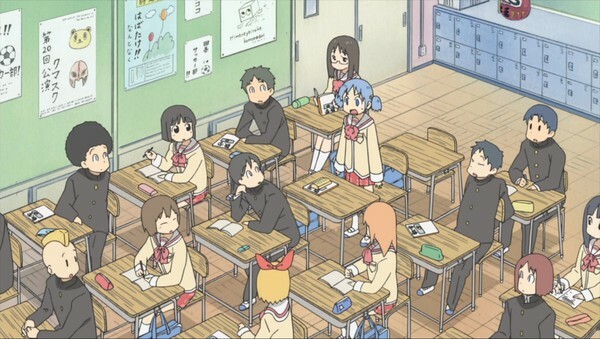 There is so much fun to be had here that it is hard not to be swept up with Nichijou. This anime is something special, the kind of series that comes along very rarely, an anime series that is so fun that nothing else matters. Is it perfect? No, but then again nothing is. Nichijou – My Ordinary Life is unforgettable. The insanity, the ridiculousness, the silly stuff, I love it all. This show should have its title changed to Nichijou – My Extraordinary Life because it is just that – Extraordinary. I can’t recommend this series enough. 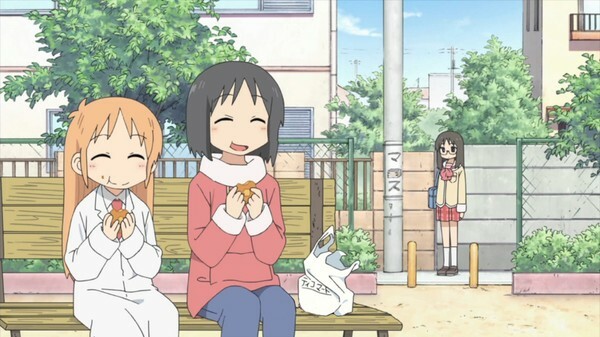 If you are looking for something fun and can tolerate some silliness, then give Nichijou a go. It may just be what your ordinary life needs.